Transport Minister Datuk Seri Liow Tiong Lai said that a total of 85 family members of the victims have agreed to attend the memorial organized by Dutch government so far. KUALA LUMPUR: Malaysia Airlines (MAS) will bring the MH17 crash victims’ next-of-kin (NOKs) to a memorial ceremony in Amsterdam, Netherlands on July 17. “Today more than 196 family members were present to make the MH17 remembrance ceremony a success in our country. “We have invited them to the Netherlands on July 17 to attend the memorial ceremony in Netherlands," he told Astro AWANI today after a press conference at the MH17 tragedy memorial ceremony at Bunga Raya Complex, KLIA. Previously, it was understood only two MH17 passengers NOKs were allowed for the memorial in Amsterdam. His ministry has also ordered MAS to expedite the process of compensation to the NOKs. 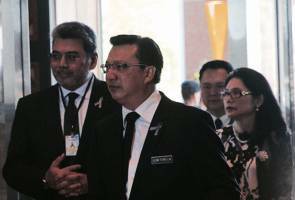 Liow also said Malaysia was committed in voicing out suggestions to improve the safety of the aviation industry, globally. Among other suggestions, he urged to introduce an International Global Trekking system for all commercial aircrafts. "I was present for the ICAO (International Civil Aviation Organization) meeting and ECAC (European Civil Aviation Conference) meeting of which in both of these important meetings I suggested that we need to have International Global Trekking for all commercial aircrafts. "Secondly for high risk routes in areas with conflict, ICAO should issue warning and provide detailed information for all flights. The information shared among countries can be known through ICAO. This will ensure the safety of the aircrafts we board," he added. MH17 from Amsterdam to Kuala Lumpur was shot down while passing through the Ukrainian-Russian border on July 17, 2015, killing all 298 passengers and crew.